Rainer Maria Rilke (1875 – 1926). Only someone who is ready for everything, who doesn’t exclude any experience, even the most incomprehensible, will live the relationship with another person or something alive and will himself sound the depths of his own being. For if we imagine this being of the individual as a larger or smaller room, it is obvious that most people will come to know only one corner of their room, one spot near the window, one narrow strip in which they keep walking back and forth. In this way they have a certain security. And yet how much more human is the dangerous insecurity that drives those prisoners in Poe’s stories to feel out the shapes of their horrible dungeons and not be strangers to the unspeakable terror of their cells. We, however, are not prisoners. No traps nor snares have been set around us, and there is nothing that should frighten or upset us. We have been put into life as into the element we most accord with, and we have, moreover, through thousands of years of adaptation, come to resemble this life so greatly that when we hold still, through the unfortunate mimicry we can hardly be differentiated from everything around us. We have no reason to harbor any mistrust against our world, for it is not against us. If it has terrors, they are our terrors; if it has abysses, these abysses belong to us; if there are dangers, we must try to love them. And if only we arrange our life in accordance with the principle which tells us that we must always trust in the difficult, then what now appears to us as the most alien will become our must trusted and intimate experience. How could we forget those ancient myths that stand at the beginning of all races, the myths about dragons that at the last moment are transformed in princesses? Perhaps all the dragons in our lives are princesses who are only waiting to see us act, just once, with beauty and courage. Perhaps everything that frightens us is, in its deepest essence, something helpless that wants our love. What you send out – comes back. 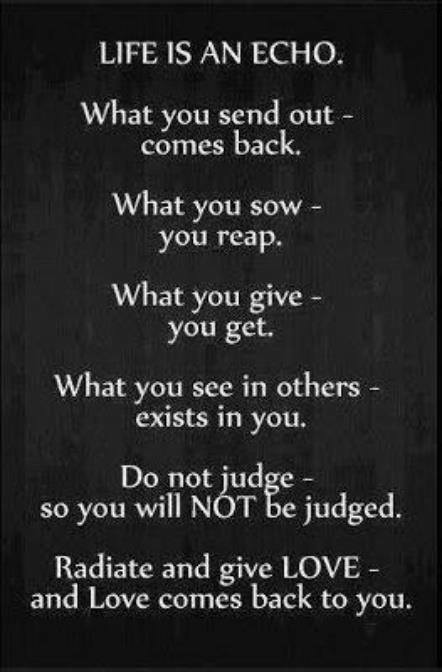 What you sow – you reap. What you give – you get. What you see in others – exist in you. Do not judge – so you will NOT be judged. Radiate and give LOVE – and Love comes back to you.